I found myself, due to an unexpected illness, eating alone near the King's Theatre on a Monday night. My children were both in a dress rehearsal for a show for two hours, so I really needed somewhere friendly and relaxed where I could plonk myself and my iPad to pass the time. Henrick's: a cosy, welcoming interior. Original image by author. After wandering the streets for 5 minutes, I was drawn to Henricks Bar and Bistro. A reasonably-priced menu, including a pre-theatre set menu, and a warm and cosy atmosphere drew me in, and after a quick glance round I decided to stay. The ambience is quiet and relaxing; I was tucked away in a corner and I sat back to enjoy the unscheduled dinner alone. I'd been seated for a minute or so and the barman popped over with a glass of iced water. It was a nice touch, for those counting the pennies, it spares you the embarrassment of asking for only water. He also pointed out the set menu for me. I decided to go for the set menu. First haggis rolls, followed by haddock and chips. Neither are usually dishes I would go for, but the choice on a set menu is naturally more limited. 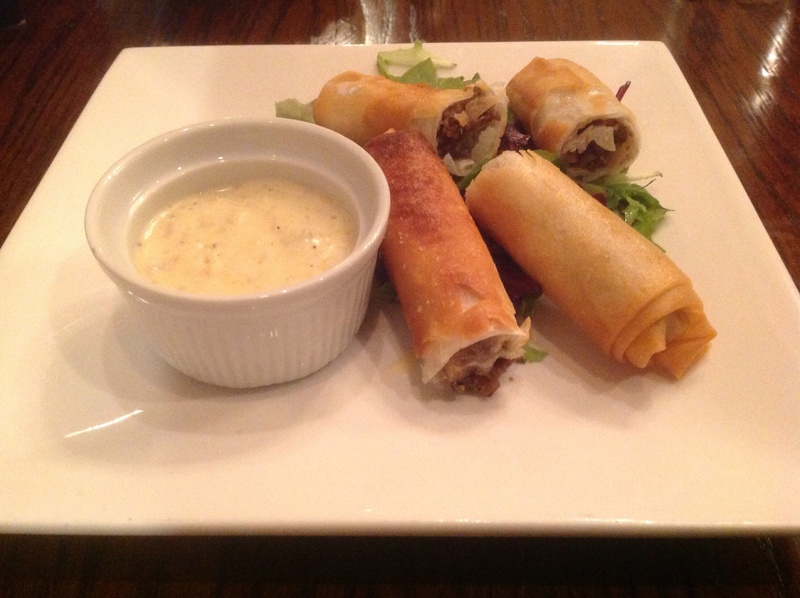 The haggis rolls came in a spring roll package. The pastry was crispy, and the filling flavoursome. I wasn't as keen on the whisky cream that it was served with, it didn't really have enough flavour to add anything to the dish. Haddock was perfectly acceptable. I liked the mushy peas, because they were more like crushed, fresh peas, although some purists might prefer the ones that taste like they come from tins. The chips were crisp and tasty. All in all, it was a well-executed pub grub classic. 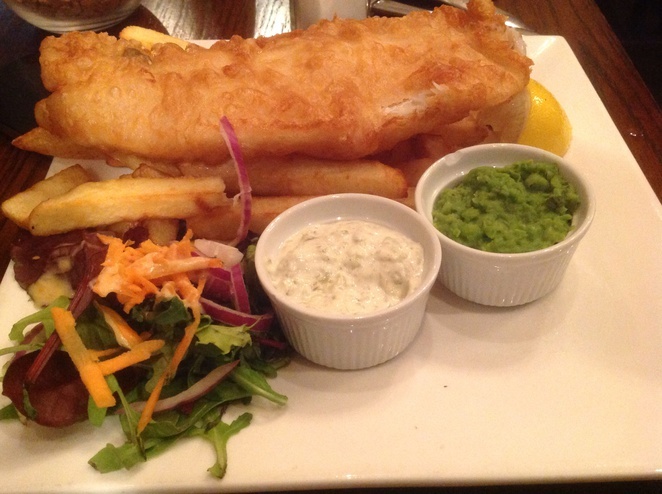 Henrick's haddock and chips: a perfect example of this kind of dish. Source: original image by author. Dessert was a mango sorbet. I was too full to have anything else, and if I hadn't been reviewing (and killing time) I wouldn't have felt I needed a dessert. The waiter spent a few minutes with me discussing the various merits of each dessert, which I appreciated as I was a bit torn over whether to have something more substantial. 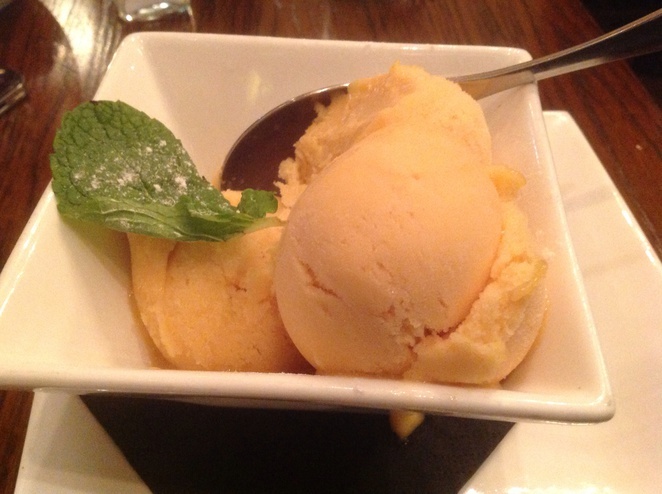 A bowl of mango sorbet at Henrick's. Source: original image by author. Overall, Henrick's provides good food, very friendly service, and all at reasonable prices. I'd be quite happy to go back, or to recommend to someone looking for a friendly, relaxed place to eat. Why? 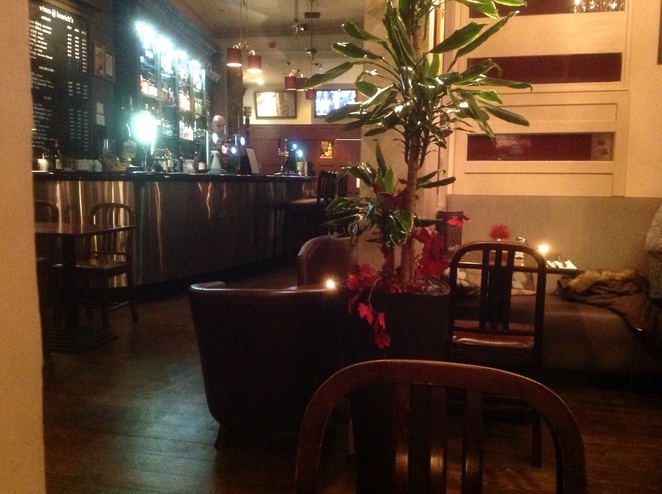 A friendly bar and bistro with a good value pre-theatre menu.